Widely grown in Australia, and mainly for the wonderful flowers over summer, Choisya ternata or Mexican Orange Blossom are a fast-growing evergreen shrub to two metres available to buy from most retail nurseries. The best known Choisya being the “Mexican Orange Blossom”, and its popularity comes form its flowers, foliage and easy care nature once established. Choisya ternata ‘Sundance’ has glossy yellow foliage, Choisya ‘Aztec Pearl’ has fine foliage and white flowers and is regarded as one of the best varieties. All are used as filler plants in the border, as well as low growing hedging plants. Growth rate is medium to fast at around 50cm a year. Choisya are a reasonably hardy plant with fragrant flowers. Shelter from drying winds, keep well mulched and prune back to maintain shape. For a little variety in foliage colour, try “Choisya ternata sundance” the yellow leafed form. 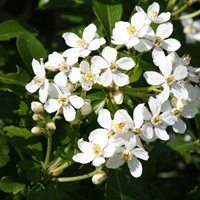 With glossy foliage all year round and fragrant flowers throughout spring Mexican Orange Blossom (Choysia ternata’) makes a great hedging plant or a specimen in the garden border. Full sun to semi shade is best. Plants can be pruned after flowering to promote a bushy habit.